When depicting the Cognitive Corporation™ as a graphic, the use of semantic technology is not highlighted. 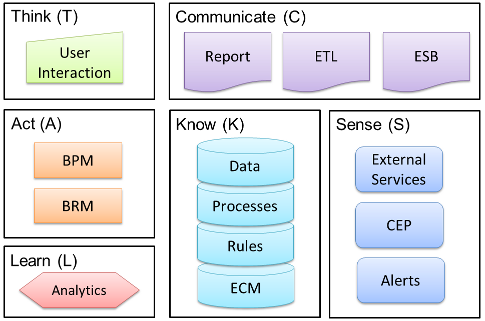 Semantic technology serves two key roles in the Cognitive Corporation™ – data storage (part of Know) and data integration, which connects all of the concepts. I’ll explore the integration role since it is a vital part of supporting a learning organization. In my last post I talked about the fact that integration between components has to be based on the meaning of the data, not simply passing compatible data types between systems. Semantic technology supports this need through its design. 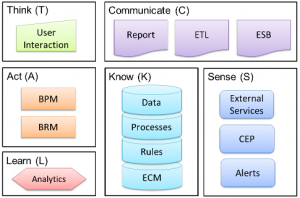 What key capabilities does semantic technology offer in support of integration? Here I’ll highlight a few. Semantic technology reduces the tie between the logical and physical structures of the data versus a relational database. In a relational database it is the physical structure (columns and tables) along with the foreign keys that maintain the relationships in the data. Just think back to relational database design class, in a normalized database all of the column values are related to the table’s key. This tight tie between data relationships (logical) and data structure (physical) imposes a steep cost if a different set of logical data relationships is desired. Traditionally, we create data marts and data warehouses to allow us to represent multiple logical data relationships. These are copies of the data with differing physical structures and foreign key relationships. We may need these new structures to allow us to report differently on our data or to integrate with different systems which need the altered logical representations. With semantic data we can take a physical representation of the data (our triples) and apply different logical representations in the form of ontologies. To be fair, the physical structure (subject->predicate->object) forces certain constrains on the ontology but a logical transformation is far simpler than a physical one even with such constraints. Cognitive Corporation™ Innovation Lab Kickoff! I am excited to share the news that Blue Slate Solutions has kicked off a formal innovation program, creating a lab environment which will leverage the Cognitive Corporation™ framework and apply it to a suite of processes, tools and techniques. The lab will use a broad set of enterprise technologies, applying the learning organization concepts implicit in the Cognitive Corporation’s™ feedback loop. I’ve blogged a couple of times (see references at the end of this blog entry) about the Cognitive Corporation™. The depiction has changed slightly but the fundamentals of the framework are unchanged. The focus is to create a learning enterprise, where the learning is built into the system integrations and interactions. Enterprises have been investing in these individual components for several years; however they have not truly been integrating them in a way to promote learning. By “integrating” I mean allowing the system to understand the meaning of the data being passed between them. Creating a screen in a workflow (BPM) system that presents data from a database to a user is not “integration” in my opinion. It is simply passing data around. This prevents the enterprise ecosystem (all the components) from working together and collectively learning. I liken such connections to my taking a hand-written note in a foreign language, which I don’t understand, and typing the text into an email for someone who does understand the original language. Sure, the recipient can read it, but I, representing the workflow tool passing the information from database (note) to screen (email) in this case, have no idea what the data means and cannot possibly participate in learning from it. Integration requires understanding. Understanding requires defined and agreed-upon semantics. This is just one of the Cognitive Corporation™ concepts that we will be exploring in the lab environment. We will also be looking at the value of these technologies within different horizontal and vertical domains. Given our expertise in healthcare, finance and insurance, our team is well positioned to use the lab to explore the use of learning BPM in many contexts. You are currently browsing the Dave's Reflections blog archives for August, 2012.